And they were all fabulous! I’ve just been on holidays and I took my iPad in case I felt the urge to write, and four novels that have been sitting on my bedside table for several months. The holiday was much needed, as I have been feeling complete burnout since about August when I launched FOUND, and I needed nothing more than to sit by the pool and read (or write). I didn’t write, although ideas still sloshed around inside my head, and instead I read. These couple of weeks of reading reminded me of why I have always been such an avid reader. Since I was a young child reading Dr Seuss right through to now, I have always found peace and comfort inside the pages of novels. Now that I write my own, I am seeing books through completely different eyes and further appreciate the skill and absolute brilliance of other writers. Everyone has their own unique way of saying things but the one thing good writers have in common, is that their words become part of you. They draw you into their characters, both real and fictional, and you are right there, in the moment with them. Crying and laughing, holding your breath and hoping things turn out okay when you know they won’t. Then walking around long after you’ve finished thinking about what you’ve just read and mourning for what you’ve lost when you reach the end. I generally don’t read many memoirs or non-fiction books, as my love affair has been with fiction from a very young age. But as I aim to become a better writer myself, I’m making a genuine effort to read more non-fiction and memoirs. There is only one fiction in this group of what I’m recommending highly for your holiday reading, and I must say I’m thoroughly enjoying expanding my reading horizons. Bush Doctors is a brilliant collection of short stories, truly Australia, truly unique. Annabelle is a wonderful storyteller and has the ability to find the story behind the story, then brings that to the forefront to grab and hold your attention, before delicately filling in the back story. By the time you reach the end of each doctor’s story, you are completely engrossed in their lives and in awe of their courage and contribution to their communities. I have a personal link with Annabelle that we only discovered last year. My mother-in-law Lyn Pouliot, a retired teacher, used to volunteer as part of an outback angels program where retired teachers went to isolated properties to be in the classrooms of School of the Air children. The Brayley family was one of the families she spent time with, and so it was with great delight that Annabelle and I discovered each other through our writing, then realised the link! I absolutely loved this book and am now going to read all her others which include Bush Nurses, Our Vietnam Nurses. Outback Vets and Nurses of the Outback. I have gifted several copies of her books for Christmas and birthdays, highly recommended! Having spent more than 15 years living in the Wimmera in Western Victoria, it’s no surprise this novel jumped off the shelf and into my hands. Since it’s release this year I have enjoyed following its author Mark Brandi on social media, whose debut crime fiction has attracted broad praise, and I wanted to savour every moment once I was finally able to pick it up. Wimmera will stay with me for a long, long time. Its dark themes, beautifully crafted characters, strong sense of place and its ability to make you feel hot when it’s hot and feel scared when it’s scary. I am not going to sugar coat this book, it’s covers several very disturbing sides of everyday life. I deliberately didn’t read reviews or detailed synopses of the book before I read it and so it caught me by surprise in so many ways. I couldn’t put it down and anyone who tried to speak to me while I was reading got no response. I absolutely loved it. At a recent writer’s course a word of advice stuck in my mind, read what you don’t normally read. This was a reminder of the philosophy of the book club a friend and I started in 2000 where ‘popular’ books were discouraged, but as the years passed I fell into the trap of reading mostly in my comfort genres. I Am I Am I Am was my foray into Memoir, and I chose well. There is so much to love about this book. It doesn’t follow a logical timeline and jumps from a young Maggie to an older Maggie back to a very young Maggie. But it is so cleverly weaved together that these jumps are connected in another, more meaningful way. Am so in awe of the writing, the language and the way the words take you deep into Maggie’s heart. I adore this book and can’t wait for a friend to read it so we can talk about it over wine. That’s the message Melissa Pouliot has for suffering families after her missing cousin, Ursula Barwick, was recently found following a 30-year search. 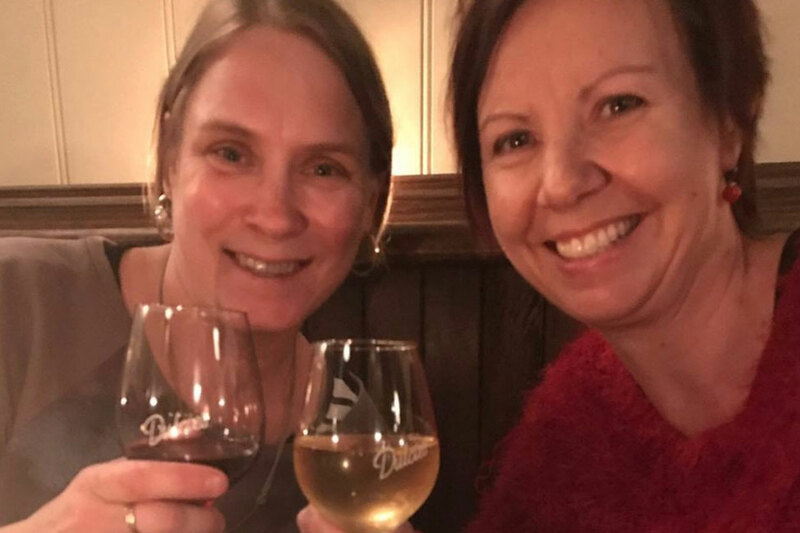 The Merimbula-based author wrote the crime fiction novel, Write About Me , as a way to honour Ursula’s memory, but it created the momentum that saw the case reopened by police and Ursula found. Ms Pouliot chronicled this journey through a series of novels and last week unveiled her fifth, Found , which was launched in Canberra. The theme of this year’s campaign is “Still waiting for you to come home”. Australian Federal Police national coordinator missing persons and exploited children Marina Simoncini said for every missing person there were family, friends and colleagues left behind, still waiting for them to come home. She said, in some circumstances, disappearing might be viewed as the only option to escape a bad situation, but in some extreme cases, a young person might have become a victim of crime. Ms Simoncini said young people went missing for a range of reasons, including miscommunication, misadventure, or because of a misunderstanding. 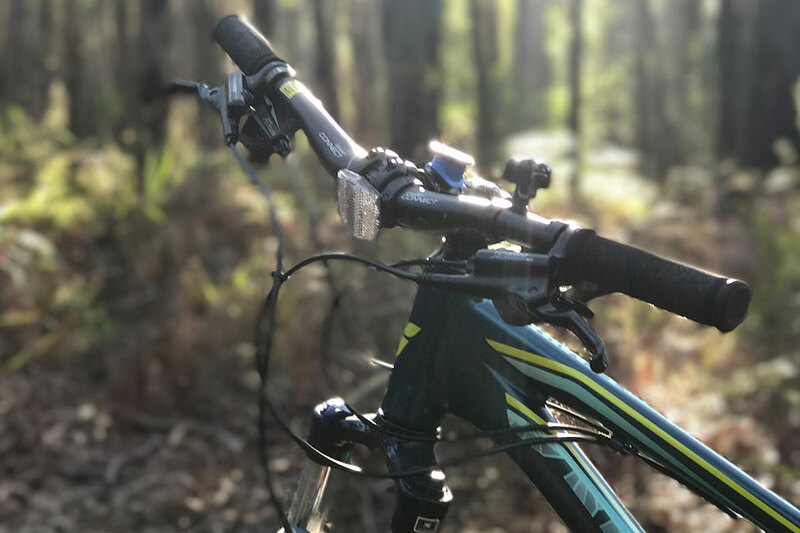 While Ursula has been found, the police case finally closed, and a memorial held at the Emu Plains Cemetery earlier this month, Ms Pouliot said the family’s quest continued. “The long journey of her death is not over yet,” she said. The details and circumstances of Ursula’s death are now with the NSW Coroner. To view Australia’s national register of missing persons, visit the National Missing Persons Coordination Centre website at www.missingpersons.gov.au , where information about support services across Australia can also be found. It was an honour and a privilege to have the Australian Federal Police launch my fifth crime novel, FOUND , in the perfect book launching venue of Muse Canberra in July. The AFP National Missing Persons Coordination Centre has played a pivotal role in the search for Ursula since 2013, and endorse all my fiction novels for raising awareness for missing people. All my special people were there to wrap me in love including my family and friends and other authors, as there was a lot of emotion surrounding the launch as it was the first time I spoke publicly about the story behind the story – that Ursula had been found . I was thrilled to also meet other families of missing people and some of Canberra’s keen reading crowd. Kings Cross Detective Sergeant Kurt Hayward, who led the search for Ursula prompted by the release of my first novel Write About Me, was also there. The 30-year search for Ursula involved a entire village of people who never gave up: her family, her friends, the AFP, the broader community and Kurt and the investigating team for Strike Force Hemingway that also included Detective Senior Constable Amy Scott. 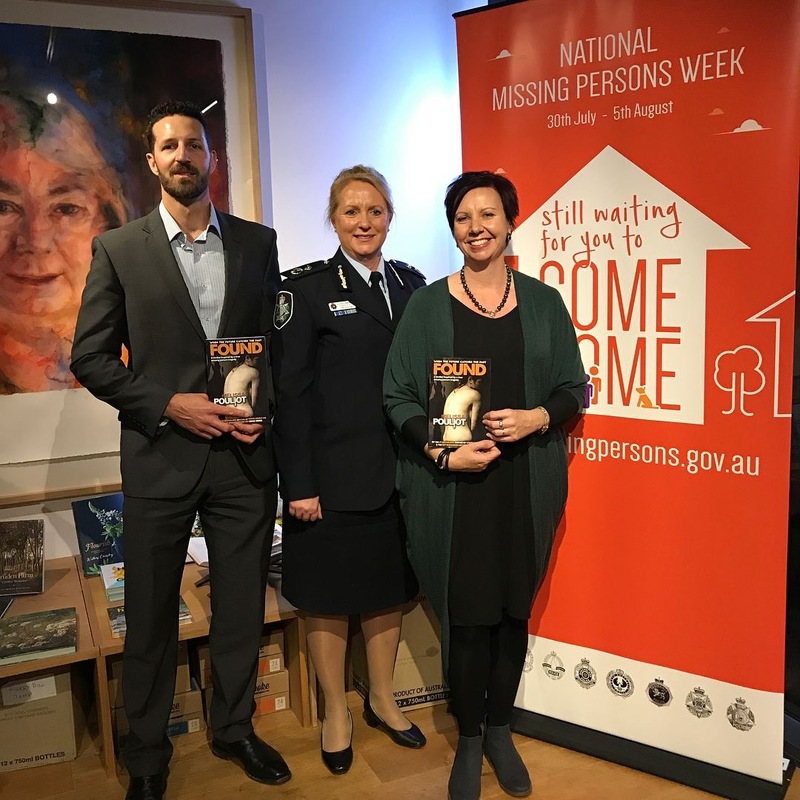 Below is part of the launch speech by AFP Assistant Commissioner Debbie Platz, which made me feel humbled and extremely fortunate to be where I am today, as a strong advocate for missing people and an established fiction author. And the family member of someone I have missed for 30 years, who thankfully now is found. “You will know there is a personal touch to all Melissa’s books, through her cousin Ursula who went missing in 1987. Ursula was the first person in Australia that the National Missing Persons Coordination Centre age progressed in 2010, she was age progressed to 39 and her picture placed on billboards in Sydney airport. She was featured again as part of National Missing Persons Week in 2015, and a result of that, we received many leads from various parts of Australia in our efforts to try and find Ursula. 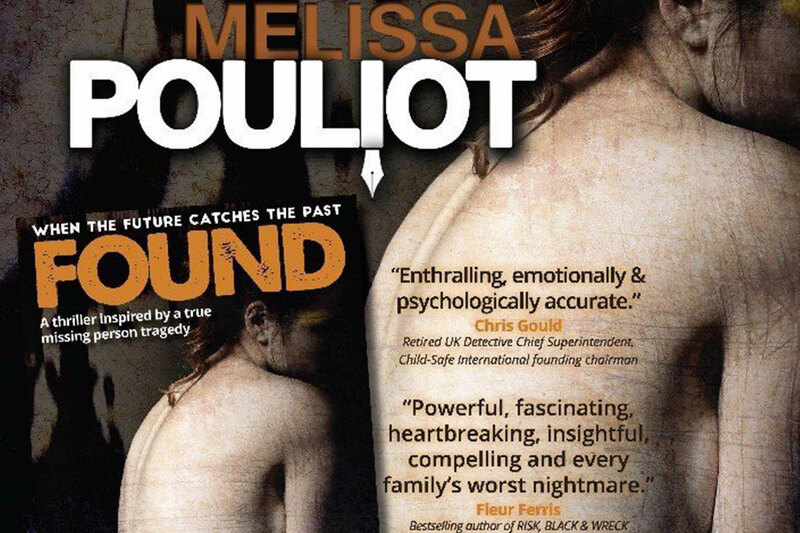 Fast forward to this year and tonight, 30 years after Ursula was first reported missing, and the launch of Melissa’s novel FOUND. This picks up the story of teenage runaway Annabelle Brown who we first met in Melissa’s first international #1 bestselling book Write About Me. Melissa’s first story was published in a newspaper when she was 8 years of age, Santa’s Elf, and since then we’ve seen her go from strength to strength tonight, to launch the fifth in her Missing Series, FOUND. One of the perks of being an author is an excuse to have a book launch party! 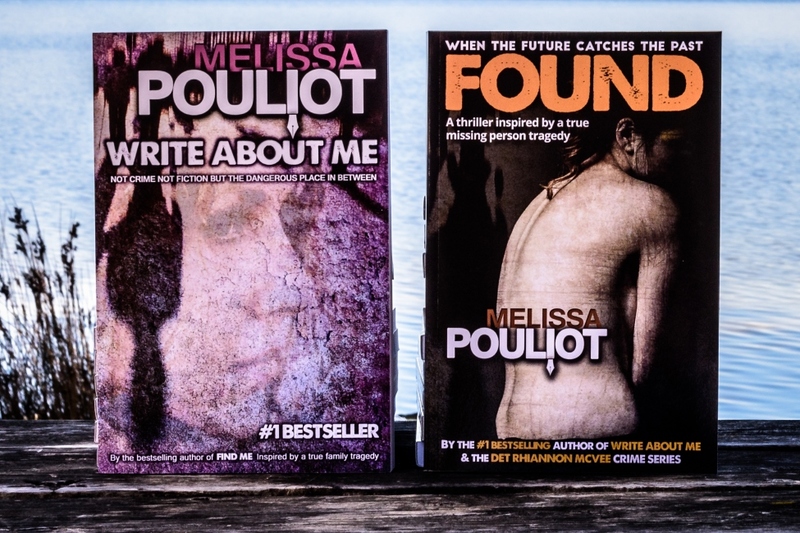 And this year I’m thrilled to be having not one, but two book launches for FOUND , my fifth crime fiction novel. 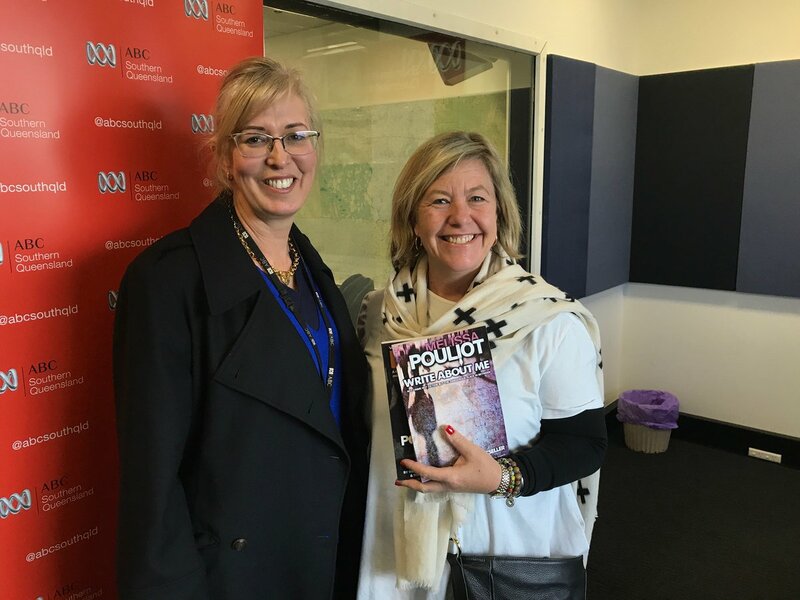 1. Who better to host the launch of a crime novel than the Australian Federal Police? 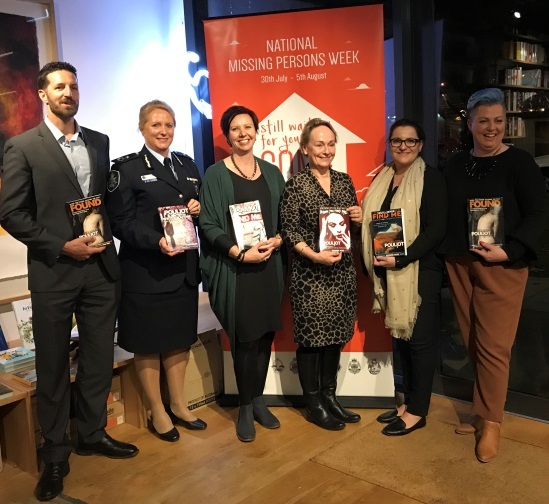 It’s difficult to find the right words sometimes, and one of those times was when the AFP National Missing Persons Coordination Centre asked if they could host a launch of FOUND in Canberra. Let me think about it…for less than a millisecond! This means so much to me, as they hold a very special place in my heart for the support they’ve given me since I published Write About Me. I will always remember my first meeting with them, clutching my new book in my hands, to see if there was anything I could do to help reinvigorate my cousin Ursula’s case. They have endorsed all my novels and taken them to international conferences, and because of the work they do, they understand the layers and meanings that surround every word I write. I’m proud to be helping raise awareness through fiction about the far-reaching impacts when someone goes missing, and beyond excited that they’re launching FOUND. Everyone is welcome, and your friends too! 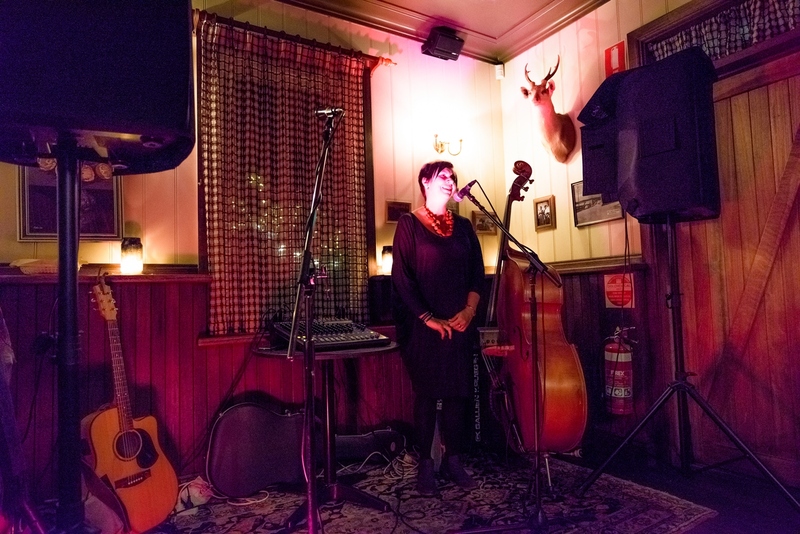 After the success of the launch of You’ll Never Find Me last year at Dulcie’s Merimbula, they’ve invited me back! This launch has it all – live blues music by Mojo, and the best burgers you’ll ever taste. Beer (or wine), an atmosphere you need to experience to believe and the friendliest (and coolest) staff on the South Coast. And of course, books! Your ticket includes a copy of FOUND, a burger and a beer or wine. Tickets are limited so you need to get in quick. Dulcie’s will post event details on their Facebook page when tickets become available. It’s that time of the year again – book publishing time! Fifth time around I feel I should have this down to a fine art. It should be completely stress-free, there should be no deadline pressures because I know exactly how long it takes to pull it all together, I should have a super-organised marketing plan that rolls out with ease and I shouldn’t have to get up at 4am every morning for the month leading up to sending my book to print to check if all my commas and fullstops are in the right place. It’s so true what they say – the life of a writer is never dull. If I tried to record what has happened in my world during the past year, even the last month, it would fill another novel, or two. So I’ll just keep things simple. My book is finished. And I love it! And I’m so excited to be sharing it with you all. FOUND is available for pre-order on Amazon Kindle as well as in my online Australian bookstore . I’m also having not one, but two book launches, one in Canberra on July 27 and a second in Merimbula on August 3. Click on the word HERE for full details – everyone is welcome to come along! In the dead of night, teenage runaway Annabelle Brown vanishes in the rugged Blue Mountains west of Sydney, in a shroud of mystery and intrigue. Twenty-seven years later, with no body, no clues and no leads, the case remains unsolved. As investigators close in on a murder suspect, Annabelle’s family realise it’s never too late to discover the truth. But will that truth ever be found ? The sequel to the #1 bestselling novel Write About Me , by the Australian author of the Detective Rhiannon McVee crime series.